The Alberta government is working to modernize family law in the province to better support unmarried partners and protect children with disabilities. 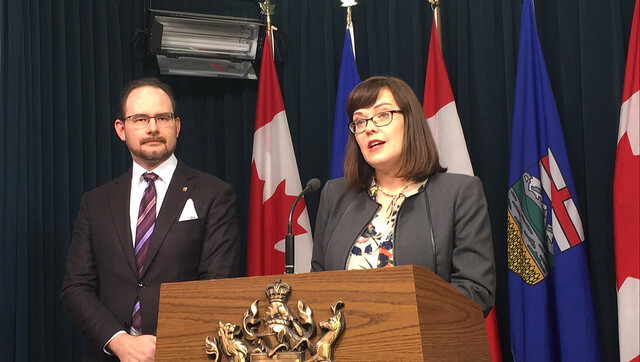 Minister Ganley and Frank Friesacher talk about proposed legislation to better support families in Alberta. If passed, the Family Statutes Amendment Act, 2018 would make it easier for unmarried partners to divide their property if their relationship breaks down. It would also clarify in the legislation that applications for child support can be made for all adult children with disabilities – regardless of the marital status of their parents. The proposed legislation would extend property division rules in the Matrimonial Property Act to unmarried couples who qualify as “adult interdependent partners” under Alberta’s Adult Interdependent Relationships Act . Generally, these rules mean that property acquired during a relationship is divided equally if that relationship ends. The legislation would also allow couples to draft their own agreement for property division, if they prefer. If passed, the act would bring changes to property division into force on Jan. 1, 2020, providing time for a public awareness campaign. Currently, the wording in the Family Law Act does not allow applications for child support for adult children with disabilities or illnesses. The Family Statutes Amendment Act, 2018 would make it clear that all parents can apply for that support. The proposed legislation would also repeal the Married Women’s Act , which was enacted in 1922. That act was originally created to allow women to own property and sign contracts. Newer legislation and the Canadian Charter of Rights and Freedoms has made it outdated and unnecessary. If the Family Statutes Amendment Act, 2018 is passed, the amendments to adult child support, and the repeal of the Married Women’s Act would come into force immediately, upon royal assent. Alberta’s Family Law Act governs child support for the children of unmarried parents and married parents in non-divorce situations. The federal Divorce Act governs child support for the children of married parents who are divorcing. The Married Women’s Act was enacted in 1922 to remove restrictions on the ability of married women to own, acquire and dispose of property, enter into contracts, satisfy their own debts and liabilities and enforce their civil or property rights independently of their husbands.